The staff at this haimish Kosher spot wear T-Shirts that say “Have a Nagila Day”. Nagila is broken up into two restaurants, one side for the pizza and veggies and one side for the meat, as to keep..well…Kosher. Do I need to capitalize Kosher? And let me kvell for a second, I think the picture I took looks delicious. I mean geshmak. I always get the same thing here. The Combination Plate. You get four deli salads, a few Falafel balls and delicious, warm pita. The tabouli is super minty fresh. If you hate mint, avoid it. And then remove yourself from my presence. 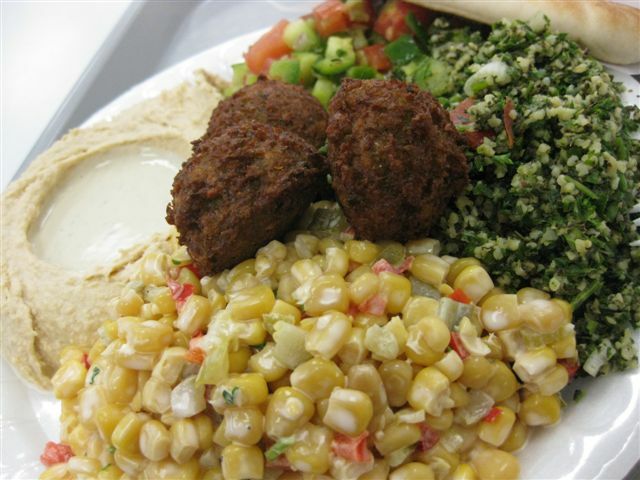 The Israeli salad and the corn salad are amazing, as is the hummus. The falafel balls are a bit small (I said balls) but they’re worth it. I smash a little bit of everything into my inviting pita, and each bite is heaven. I really should eat this whilst donning a welders mask as to protect the innocent, it’s not a pretty sight. At Nagile, I see I am the only male diner not wearing a Yarmulke, but I was not dissuaded. When every person in the joint stared at me and my friend (the only goyim) as we entered, I was not disheartened. When this shmendrik ran screaming from the restaurant with hopes of stopping the mamzer meter maid from giving him a parking ticket, I did not chuckle.